Shivaji University recently released a notification for 15 various posts. 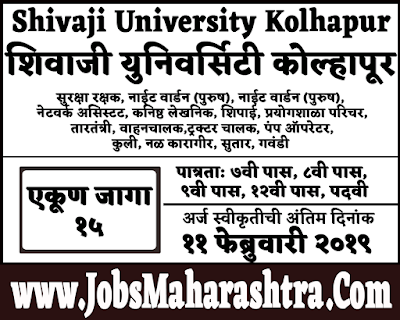 Eligible candidates can apply online on the official website of Shivaji University. For more details like age limit, salary, how to apply, selection process please refer the below article. Age Limit:- Minimum age limit is 25 years & Maximum age limit is 58 years. Eligible candidates can apply online on the university’s website in the Recruitment section before 11-02-2019. And attend the interview venue on given below dated with the application form print & related documents.